New: An Art Collection page for 2019 Art has been added. Visit the Art Gallery where I have posted paintings I have done of Irish monastic sites, crosses, seascapes and landscapes as well as a few Neolithic sites. Welcome to Irishhighcrosses.com. 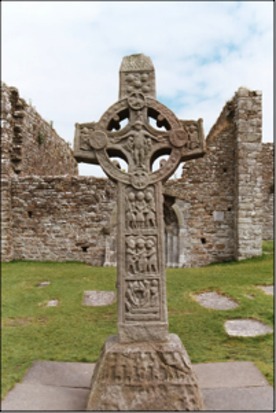 The purpose of this site is to offer an introduction to the subject of the Irish High Crosses. These are crosses like the Scripture Cross at Clonmacnoise in County Offaly, pictured to the left, that were carved prior to the year 1200 CE. Preface through Scripture Crosses, offer an introduction to various aspects of the study of Irish High Crosses. Antrim Crosses through Waterford Crosses, introduce the crosses on a county by county basis. Images of the Fall through The Resurrection explore particular types of images across a number of different crosses. Listing by the name of the cross of the images that appear on each cross. Art Gallery contains paintings, mostly pastel chalk, by Barney McLaughlin, of Irish monastic sites, crosses and landscapes as well as a few Neolithic sites. I am a beginning painter and hope you enjoy some of these images. Contact Us: Your comments, suggestions and questions are welcomed at barneyrew33@gmail.com For a bit more information about the site, visit http://www.sandvoxsites.com/person/hqzwqtzlgx or http://www.sandvoxsites.com/website/nsltnlvz. All photos and illustrations, unless otherwise noted were taken by the author. Information and photos of the old monuments that dot the Irish landscape. Giving priority to those monuments that are less known or that are far from the touristic itineraries. Some not signposted. There are many photographs on the site and a variety of ways to search for monuments. Specifically focused on Early Christian sites up to about 1100 CE, this site is arranged by Irish County. It has photos of nearly every High Cross. The High Crosses are categorized with Cross Slabs. Photographs are good. There is no guide to location and minimal background. A sister site to Irish Round Towers this site has numerous photographs of some of the High Crosses. An excellent site, and not just for megalithic antiquities. There is a separate section on High Crosses that contains pictures, general background and location information on at least 54 sites. On the home page you can search by Irish County. For each cross presented there are links to other nearby cross sites. Originally dedicated to Irish megaliths, but now expanded to include other antiquities, including Early Christian and Medieval monuments. Provides coordinates, has information on at least 49 High Cross sites. Pictures are small but can be enlarged. This site is part of archaeology.ie and has an exhaustive listing of all kinds of archaeological sites in the Republic of Ireland. Search by County and by the type of site you are looking for. Click on a site and a map showing the location of the monument will be provided. A very useful source in seeking to find High Crosses. Arranged by Irish County this site has great pictures, including details of many of the decorations on the crosses. Offers basic information on many of the Irish High Crosses, including at least 26 locations, many with multiple crosses.